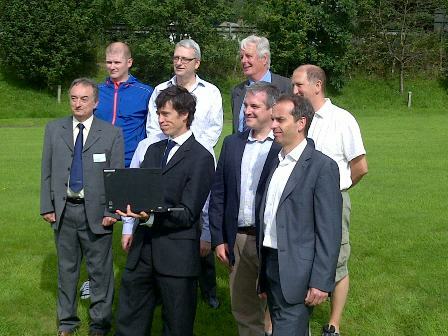 Rory, who helped bring an experimental 4G mobile broadband trial to residents of Threlkeld in his constituency earlier this year, joined local residents and business owners to hear about their successful broadband experiences at an event on Tuesday at the Threlkeld Cricket Club. More than 50 residents from a number of local businesses – including a regional office of United Utilities, the Blencathra Field Studies Centre, the King Kong Climbing Wall, Walker Ellis, and local web developers – have been participating in the trial. The event was also attended by the Cumbria Constabulary, Kewsick Mountain Rescue, Threlkeld Parish Council, Northern Fells Broadband Committee and the Broadband Stakeholder Group, amongst others. Employees of various local businesses in the Threlkeld area are testing 4G using both dongles and routers. The trial is achieving speeds of 20 Mpbs, allowing businesses to achieve unprecedented levels of productivity. The area, which was personally proposed by Rory, was selected as the location for the trial as it currently has insufficient or unreliable broadband. Residents have warmly welcomed the new service, saying it is providing significantly improved connectivity that is benefiting them personally and professionally. The innovative trial was opened in May by the Secretary of State for Education, Michael Gove and Rory, who worked closely with the telecommunications company to bring the trial to Cumbria – the first of its kind in the north of England. The trial is exploring how 4G can be deployed over airwaves currently used for 2G and 3G services.